My Little Patch of Sunshine: Turkey Vultures! My sister told the boys about the "Welcome Back Buzzards!" 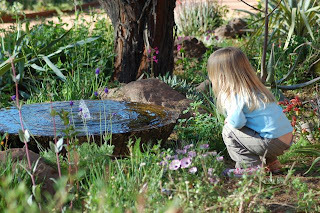 event at Boyce Thompson Arboretum. And then told me that it started at 7AM (which meant we had to leave at 6AM. And I am NOT a morning person -- not at all!!) The boys seemed excited and I didn't know much about turkey vultures, so I agreed as long as she gave me a wake up call. This morning, I stepped out of my room to wake the boys and found Nate fully dressed, eating a bowl of cereal. He had set his alarm and gotten himself up and ready! I roused Colin and then Lydia, who both got ready with no complaint. My sister arrived early and we headed out while watching the sun rise over the Superstition Mountains. 45 minutes later, we arrived at the Arboretum and walked back to the area where the turkey vultures roost overnight. The park opened an hour early so visitors could have a chance to see the turkeys roosting and as they began to leave in the early morning. Unfortunately, it was a windy morning and the turkey vultures had already taken off before we arrived. 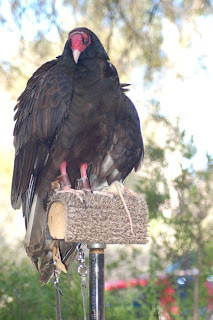 The event happens every spring, as the turkey vultures return from wintering in Mexico to spend their summers in this part of Arizona. They travel up to 50 miles a day searching for road kill and other carrion. I was extremely impressed with my boys. They answered questions when they knew the answers, asked thoughtful questions, and weren't afraid to imitate a quail's call. They listened attentively and took in as much knowledge as was shared! Even Lydia was patient, occasionally raising her hand to be part of the conversation. 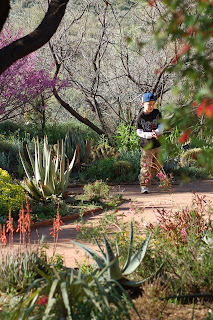 During a restroom break, she walked along the path and began pointing out the different types of cactus she recognized and asking me the names of the ones she didn't. I want my children to have a lifelong quest for learning, and today's event gave me a glimpse that they definitely love to learn. Since the turkey vultures weren't to be seen, I thought we'd go to explore on our own, but Nate said he was really interested in learning what Paul had to say. Colin had brought his binoculars to get a better look at the turkey vultures, but eagerly used them to look for other types of birds. We visited tables set up by Arizona Game & Fish Department volunteers that displayed some of their rescue animals -- including hummingbirds, ground squirrels, bats, hawks, kestrels and even a turkey vulture! 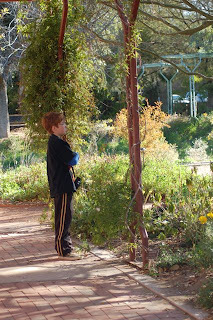 We explored the demonstration garden a bit before finally heading home. It was a wonderful way to spend the morning, and well worth the 5:30 wake up call!